I joined SITC a few years ago due to a long-standing interest in immunity. One of my earliest experiences with my immune system was at age 12 during a Boy Scout project in Utah clearing trails through the woods. I was exposed to poison oak, causing a mild rash on my legs and arms. When we went back a few weeks later, I volunteered to take care of all the poison oak bushes, thinking my prior exposure had inoculated me against it. I was dead wrong. A few days later I was in the doctor’s office with my face swollen up like a balloon and weepy sores all over my body. I had to take a cortisol injection to turn down my T-cell immune response which was attacking the poison oak antigens on my skin and even attacking areas where I wasn’t directly exposed. Needless to say, I learned a lot that day about the power of the immune system and how little I understood it, and that not all exposures are protective – in fact they can rev up the immune response. We see that with cancer immunotherapy. I see many patients in clinic each week who have failed multiple lines of chemotherapy. Many are on immunotherapy, sometimes as the last hope. Spread of the cancer to bones, liver, lungs and skin can cause pain or symptoms for many of these patients, and also an opportunity for radiation to be of service in giving pain relief and improved control of life-threatening tumors. 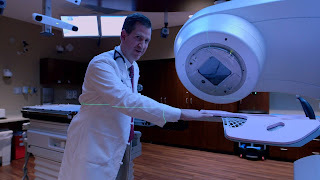 It also provides an opportunity for radiation to help synergize locally with immunotherapy, in much the same way that we have found chemotherapy given at the same time as radiation to improve tumor control and cure rates for earlier stage tumors. Two of my mentors at UCLA, Dr. Steve P. Lee and Dr. Guy Juillard, gave me insights into the pairing of the immune system and radiation. Dr. Juillard noted decades ago that patients without an immune response didn’t clear their tumors after radiation. In essence, the radiation damages the cancer, but it’s the immune system that gets rid of it. He was also a pioneer in intra-lymphatic immunotherapy, by injecting irradiated tumor cells into lymph channels, he could spur a cellular immune response. Radiation was the most effective way to transform a patient’s extracted tumor into a vaccine. Dr. Steve P. Lee would often talk with patients about how in order for a tumor to get big, it must have already escaped the immune system; and how failure of immune surveillance in organ transplant and AIDS patients can lead to skin cancers and lymphomas. I remember treating patients at UCLA with Kaposi’s sarcoma, a virus-induced skin tumor that is normally kept in check by the immune system, until the later stages of AIDS cause loss of cellular immunity. Radiating these sarcomas, even to a very low dose, brought back control. Right now, it is very humbling to go to immunotherapy meetings. The unknown is so vast. It was truly said by John Berger, “Never suppose that the advance of knowledge reduces the extent of the unknown.” Fortunately, drug approvals are happening so fast that it is never boring. A basic limitation, though, is that very few patients on clinical trials for immunotherapy (or any drug for that matter) can receive radiation while on the trial, even for palliation of painful growing tumors. This means that we aren’t capturing as much knowledge about the interaction of radiation and immunotherapy as we might, so progress is slow and often limited to looking back at how people responded who coincidentally got radiation and immunotherapy at the same time. Fortunately, some very promising things appear to be happening when patients get radiation therapy after initially responding to immunotherapy. I plan to write about how radiation can be combined with immunotherapy for greatest effect, and the safety of doing so. I hope that the patients and doctors who read my blog may overcome some of the fear of the unknown that exists at the intersection of two expanding frontiers: immunotherapy and focused radiation.